Believe it or not, in this day and age there are many businesses around the world that continue to use laser printers for their barcode labeling needs. This represents a potentially huge untapped market for partners to sell today’s more effective and efficient thermal label printer solutions. There are many advantages that together make a persuasive case for any organization using laser printers for labels to change to thermal printers. Let’s review the most compelling advantages. In both thermal processes, the imaging is embedded in the media. Any time you print with laser, you have to have a toner. There is no option to use some other printing method. With thermal, if you have a low price point – a low cost target – you can go with direct thermal technology that has the imaging solution in the media. On the other hand, if you need a higher-end solution, you can go with thermal transfer. That ribbon gives you the option of high-quality printed images, but you don’t have to burden every solution with it. So there is flexibility in terms of cost and quality. With laser, there is no similar flexibility. Further, the handling of toner and toner cartridges can be messy, problematic, or just plain frustrating. They demand special disposal because they represent a material hazard. Thermal technology enables you to print single, one-off labels versus sheets of labels. This is one of the essential label printing efficiencies of the technology. In many stores (e.g., groceries, pharmacies), item and shelf labels are preprinted on laser printers as pricing updates and changes are made. Employees put the labels on a cart, roll it out on the floor, then go up and down the aisles taking off the old labels and affixing the newly printed ones. Watch the process: every cart carries a trash bag behind it, not only for the labels being replaced, but for the newly printed labels as well. Employees take a laser sheet, pull three or four labels off, and then throw away the balance of the sheet, often more than half of the printed labels. The waste is tremendous. With a thermal printer, you can put the printer on the cart and print right there and then. There’s no need to preprint – just roll it out with a terminal, scan, and print. 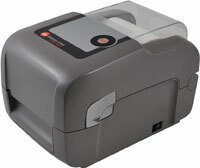 If you compare the two technologies, a thermal printer such as Datamax-O’Neil’s E-Class Mark III uses about 3 amps of current, while a small laser printer uses about 7. That’s an energy savings of over 50 percent, and a green, sustainable advantage for thermal over laser. The energy savings are directly related to design and technology. More parts (and actions) are involved in a laser printer: a heating drum, a laser, and a fuser. Conversely, a thermal printer has a heating element in the print head and a motor that moves the paper. That’s it. It’s another example of simplicity paying off, in this case with improved energy efficiency. A small desktop thermal printer is about a third of the size of a laser printer. Desktop models fit conveniently in small places such as nursing stations, retail counters, laboratories, etc., where space is at a premium. Thermal printers can print long, continuous banners; laser printers cannot. For example, the E-Class Mark III can print 99 inches on a 4-inch-wide material. Other thermals can print wider. With a laser, there is no possibility of loading 99 inches of material into the back of the printer. With the thermal printer, there’s no need to load from the back; simply have a source of continuous stock to feed to the printer. Until recently, many thermal printing solutions didn’t have features such as wireless connectivity, LAN capability, or Bluetooth; but now these technologies are available with thermal solutions and contribute to mobility. In more and more solutions, the printer is attached to a powered cart and married to a terminal, whether in a hospital, retailer, or shipping facility. The whole solution moves on regular rounds with the employee. They get the full benefit of printing on-demand in real time. The misperception may exist that thermal printers have a higher up-front cost than lasers when used for label printing. Not true. Most stores and organizations using laser printers for labeling purposes use models that have a price point around $1,000. The price for a basic E-Class Mark III, for example, is about half that cost. Yet the real savings of the thermal printing solution comes over time. Less maintenance, more productivity, less energy consumption, and less wasted materials—it’s the lower total cost of ownership that puts the real financial distance between thermals and lasers.